My Very Own Space is a traditional picture book with a simple story and a simple character, unless the reader lingers a little before turning the pages. For a while, all seems to be settled. Jack reads. His bunny buddies carry on. But then Jack hears their music, smells their freshly baked cake, and misses being part of their laughter. Sadly he realizes that not even he himself is allowed to cross OVER his boundary line. Little White Bunny enters the scene, evaluates the line and finds a loophole, innocently entreating a compromise by going UNDER the line. All eyes are suspended on Jack in breathless anticipation to see how he will react to the cross-under. Sensing his platform for change, Jack realizes he can be a trendsetter. Then he gets it: sometimes a bunny wants to be still, and sometimes part of the commotion. Henceforth, little groupings of bunnies peel off and enclose their own activities within boundaries. Bunnies come and go freely from group to group as they so choose and there concludes the quick-and-simple version of the story. The linger-a-bit version takes the story a good deal further. Crane wastes no time in establishing the first page tension between Jack and everyone else. How did Jack get such an idea into his head to be alone when it seems perfectly natural within his clan for everyone to be rowdy and energetic together? From a book! The very book Jack wants to read is titled Space Bunny—but with a twist because the pictures on this book are of a rocket ship and an astronaut bunny. Evidently Jack wants to be in OUTER space, putting into existence what is in his imagination. He is craving an adventure that is distinctly separate, a way to create his own identity, to push through the collective hubbub and be himself. He needs to stake his claim in a different manner: by asserting his right to be his own bunny. He reads his book and inserts himself resolutely into the role of astronaut complete with alien encounter, where he attempts to communicate what it’s like back in his earth world, being a bunny. Once finished with the Space Bunny book, he has satisfied his need and also has realized how great it is to have what he has. He can be himself AND he can be part of his friends and family. Things are all good. He needed his figurative and his literal spaces, his getaway, in order to grow. The next dilemma, then, is close at hand. Not wanting to stay isolated inside his declared space but neither wanting to go back to the way things were before, he needs a way to reestablish his boundaries. Friendly and thoughtful Little White Bunny helps ease the transition and presents a new normal for the entire group. 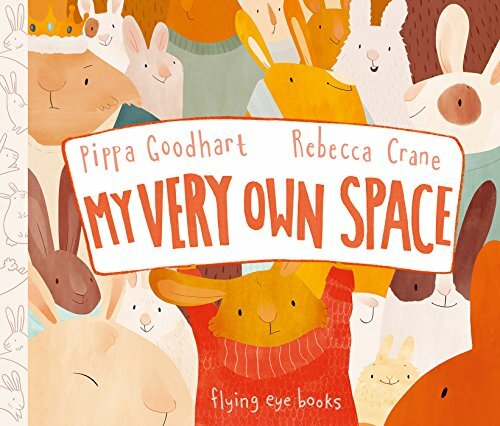 Tackling the traditional out and back quest for personal identity in a relatable, tangible and enjoyable representation, Goodhart's and Crane’s My Very Own Space is a super-engaging and thoughtful book, just fine for a quick and casual read, but better for a lingering one.